Jack Nicholsonis still supporting his favorite team. 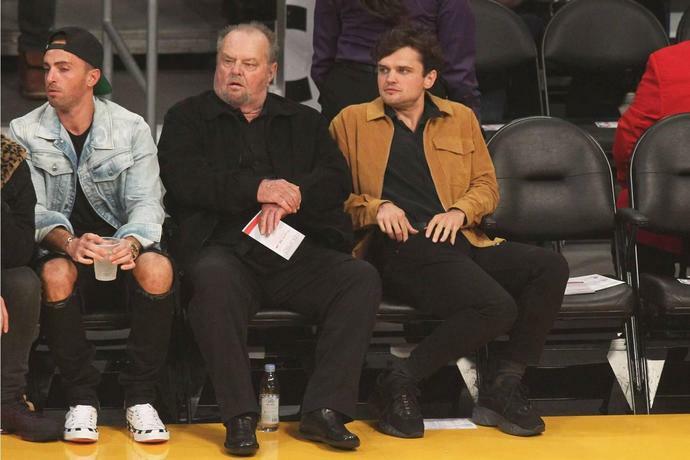 The longtime actor, 81, took his usual seat courtside at the Lakers game on Wednesday alongside his 26-year-old son Ray Nicholson. Wearing all black, Nicholson watched his favorite basketball team closely while Ray followed along wearing a beige jacket. The Lakers defeated the Minnesota Timberwolves, likely making the longtime fan happy. Nicholson is rarely seen at pubic events; he was last spotted at the Lakers' season opening game with LeBron James making his debut for the Los Angeles team. Ray also joined his dad during that outing. Nicholson hasn't appeared in any projects since 2010's How Do You Knowand told The Sun in a 2013 interview that he's less motivated to "be out there any more." "The movie business is the greatest business but I only want to do films that move people, films about emotions and people," he added. Since then, Nicholsonsigned on to do aToni Erdmannremakein early 2017, butdropped out of the filmin August of this year. His son Ray, on the other hand, is trying his hand at the family business and appeared in the season finale ofMayans M.C.this week. Creator Kurt Sutter spoke toEntertainment Weeklyabout casting the acting icon's son. "We're buddies. I'm mentoring him," Sutter said of Ray, whose mother is Rebecca Broussard. "He's such a sweet kid who's a really good actor. And it was so fun for him. He doesn't know the world, right? I think it was more about the experience of putting on that kutte and hanging out with those guys for a night. It was just an education for him." Nicholson had son Ray with actress Rebecca Broussard, 55, who he also shares daughter Lorraine, 28, with.